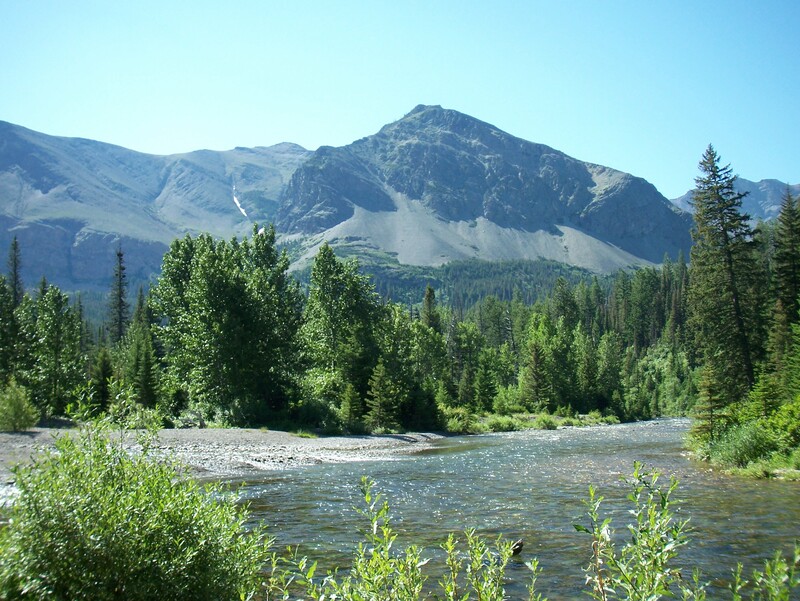 When we visited Fairmont Hot Springs, I walked each morning and we went below the hot springs one evening for a short hike. On the walks and hikes, I took pictures. On Sunday, we went to church. As we came out, this buck posed for pictures. He was in the shade so I cropped the picture and, as a result, it is a bit blurry. I walked each morning and afternoon. This doe crossed the road about the time the sun was coming up each morning. She kept an eye on me, just to make sure. Just outside Fairmont is Columbia Lake, which is the head waters of the Columbia River. The lake appears to have a mist over it most of the time. When I walked in the morning, I took this picture as it was becoming daylight. The mist was much heavier at this time of the day than it was during the day. Several evenings we went to the hot springs. On one of the evenings, we walked below the springs and found a path to a small creek. The moon was just rising from behind the mountains. A small water fall flows into the creek. The volume increases when they release water from the swimming pool to clean it. I took the picture without any flash. I don’t know if it is the rocks, the time of day, or some other reason that allowed the picture to appear so well-lit. Posted in Nature in All Its Glory, Photography, teacher as transformer and tagged Columbia Lake, Columbia River, Fairmont Hot Springs, nature, photography, Rocky Mountains, teacher as transformer. Bookmark the permalink. I was on the road today, driving through part of Alberta I do not spend much time. I drove to Fairmont Hot Springs, which is in British Columbia. 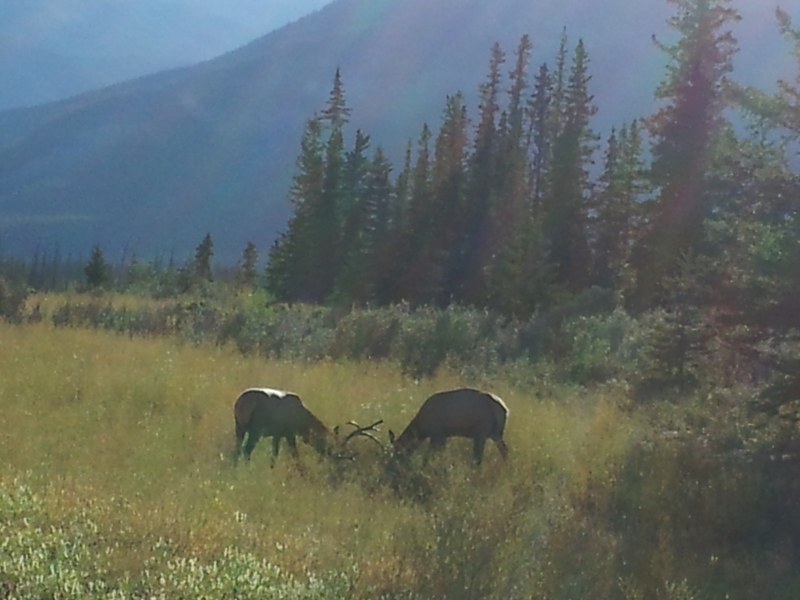 To get there, we came via Banff National Park. The normal route west usually takes me through south of Banff and Jasper National Park. It was a beautiful day and two mountains stood out against the sky with clouds in behind them. I am not sure of their names, because of a lack of knowledge of the area. 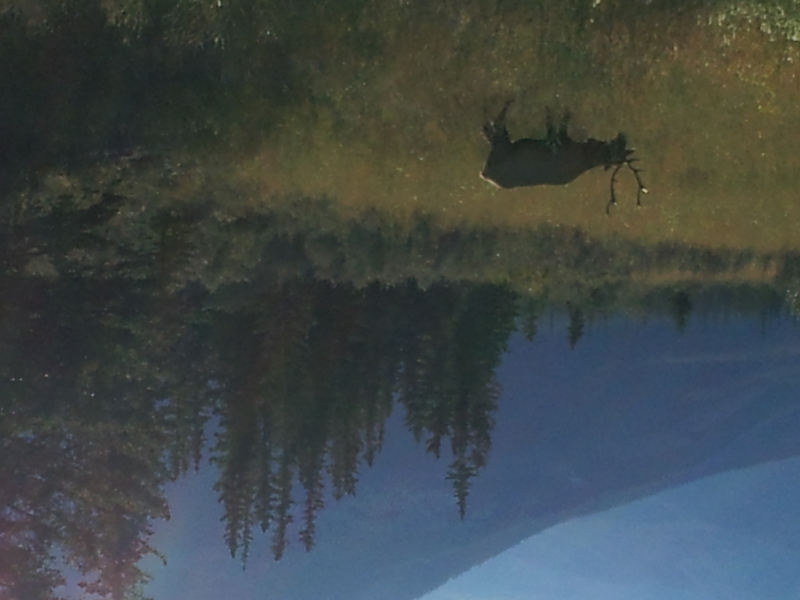 It was in the Mount Norquay area, but I thought Norquay was further to the north. This might be Mount Norquay. It seemed to be the mountain that stood out and was the focus of the pullouts, but I don’t know the area well enough to be certain. These palisades are just off to the side of the mountain above. 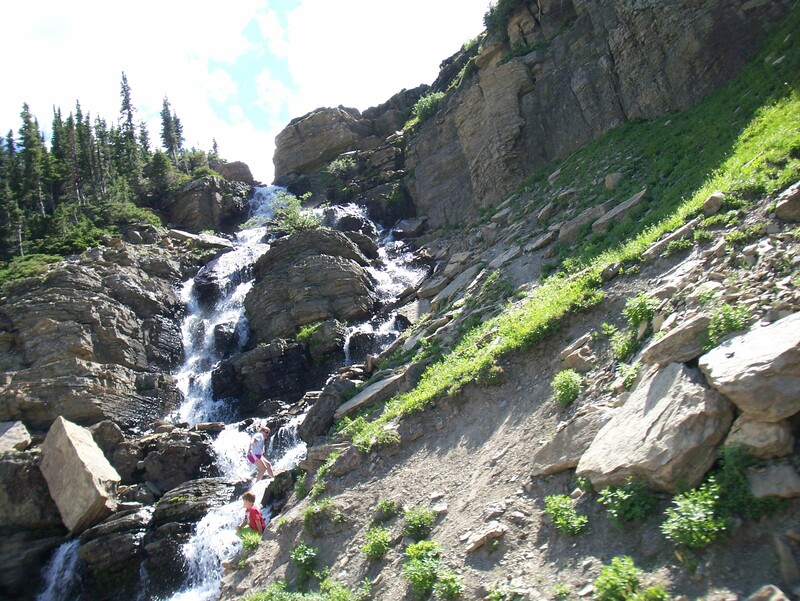 This is just above Numa Falls in Kootenay National Park in British Columbia. The mountain parks on the British Columbia side are not as well-developed as the ones on the Alberta side. I use the word developed in a relative way, as none of the parks have significant commercial development. 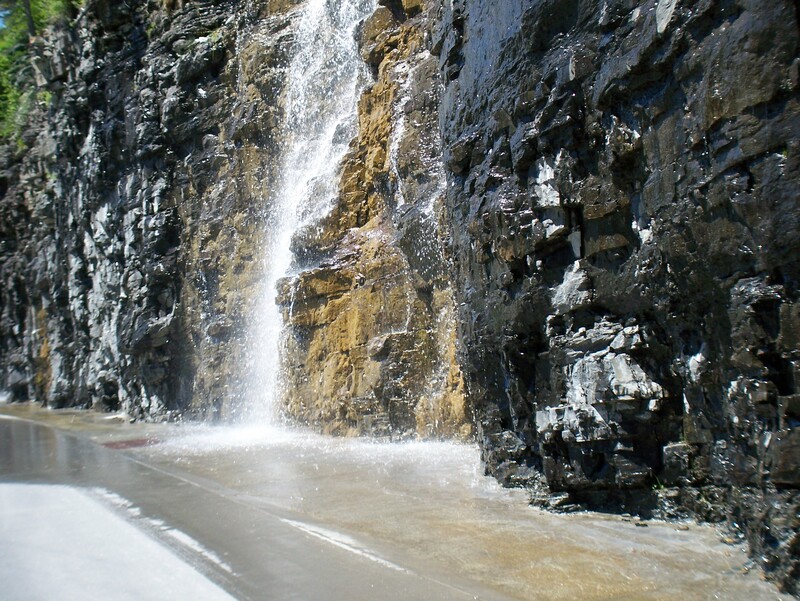 We were not able to get any closer to the falls as the bridge is out and the gorge has no direct access. 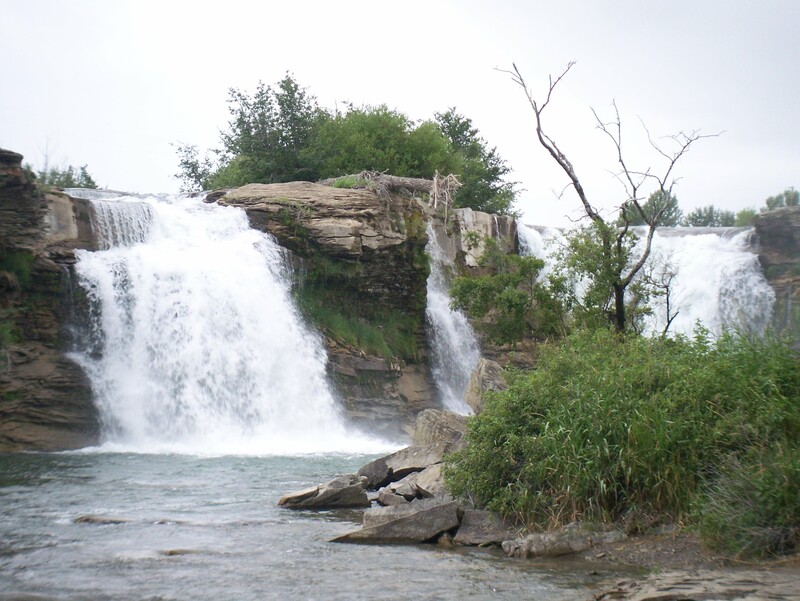 Below, is a video of the falls from YouTube. I don’t see a bridge in the video, but the gorge is inaccessible. Posted in Nature in All Its Glory, Photography, teacher as transformer and tagged Banff National Park, Jasper National Park, Kootenay National Park, nature, Numa Falls, photography, Rocky Mountains. Bookmark the permalink. 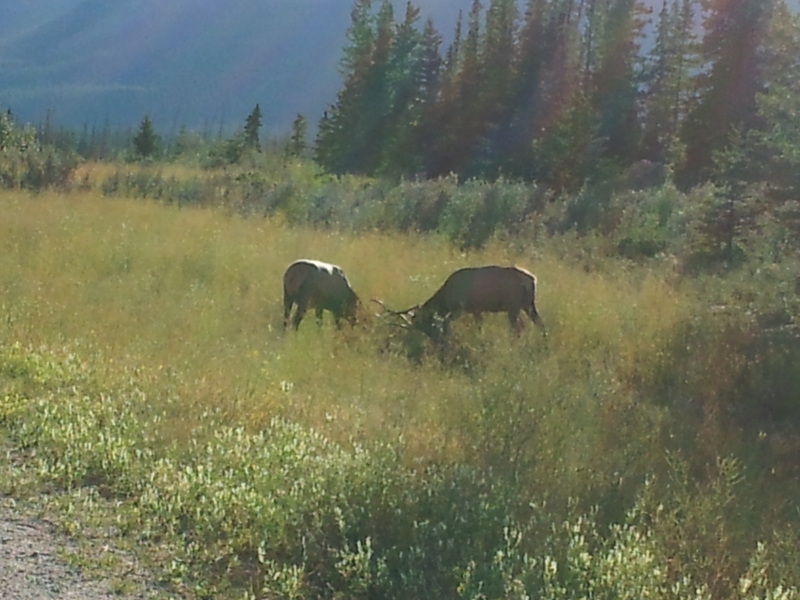 I traveled the last couple of days and, as I went through Jasper National Park, I came across these two elk. They were just off the side of the highway and have a full rack of antlers. This one was by himself eating. This one was not as cooperative in showing his face. The shy one decided the grass was greener over in the other one’s pasture and began to move over. The interloper begins to push the original out of his pasture. You could hear the clash of the antlers and the intruder seemed able to push the first one back. 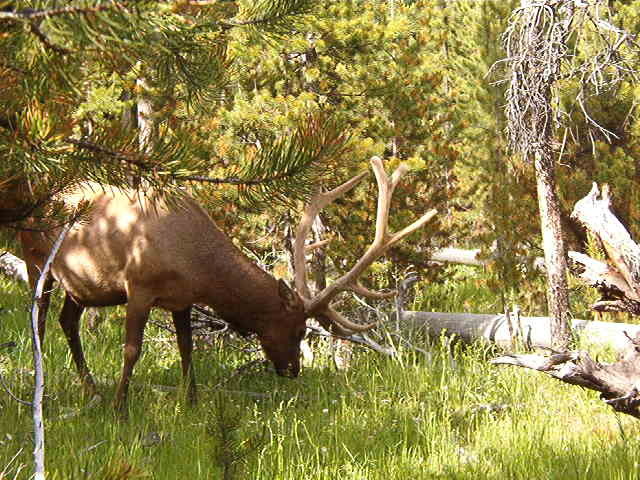 I was closer to an elk when we were in Yellowstone several years ago. There is a story to the picture I took as I climbed down the embankment into the ditch and a moment later one of the other tourists we were with tumbled down the embankment. I told her it was OK because I thought could run faster than her. I was probably 50 or more feet away from the ones in Jasper. 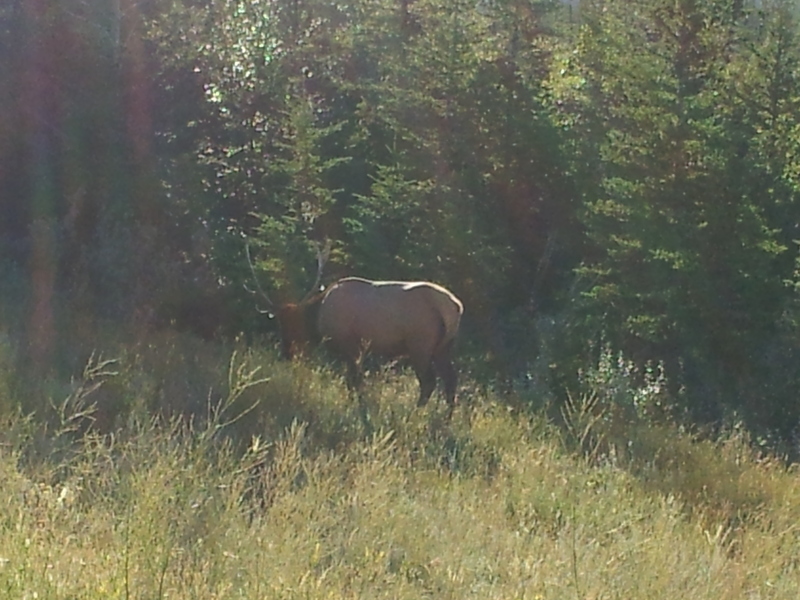 I was only about 15 feet from the one in Yellowstone. Posted in Nature in All Its Glory, Photography and tagged elk, Jasper National Park, Rocky Mountains, teacher as transformer, Yellowstone National Park. Bookmark the permalink. 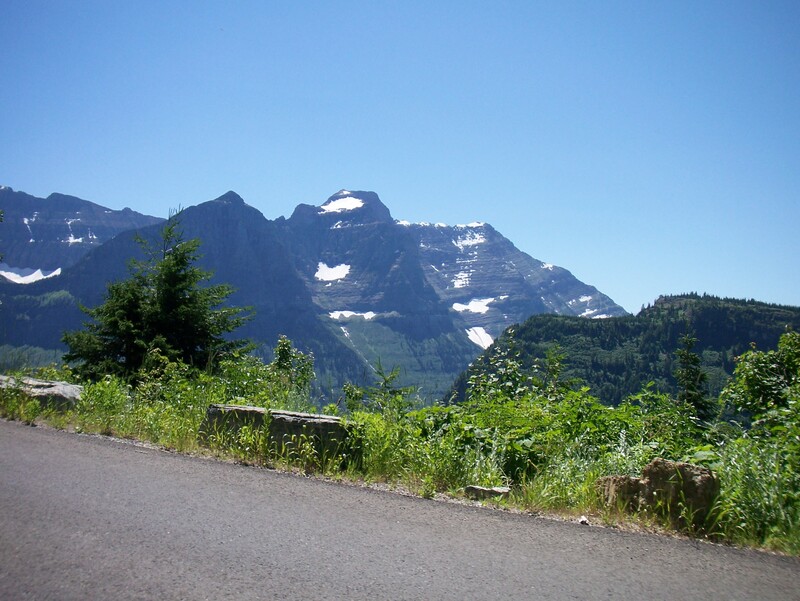 Logan’s Pass includes the Going to the Sun Road in Glacier National Park. When I looked, the view was spectacular and breathtaking. 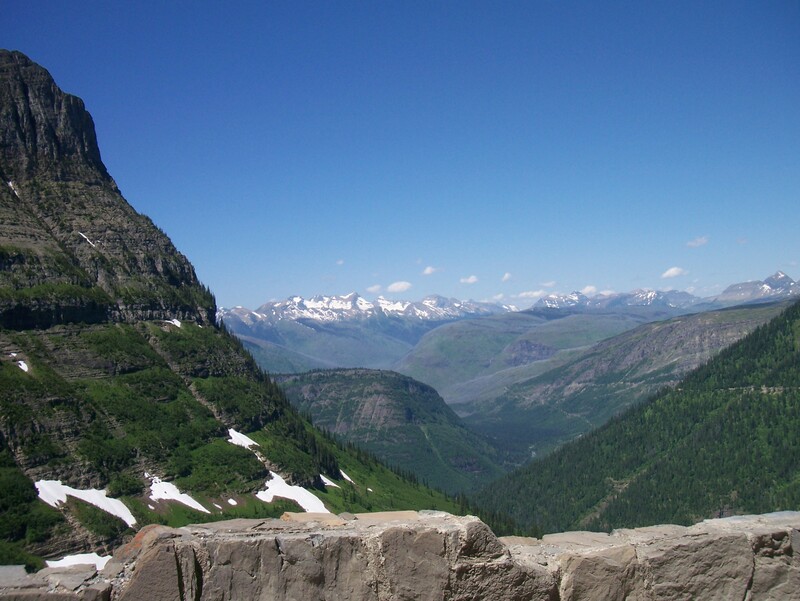 The park was named for the many glaciers that are part of the landscape and so visible through Logan’s Pass. 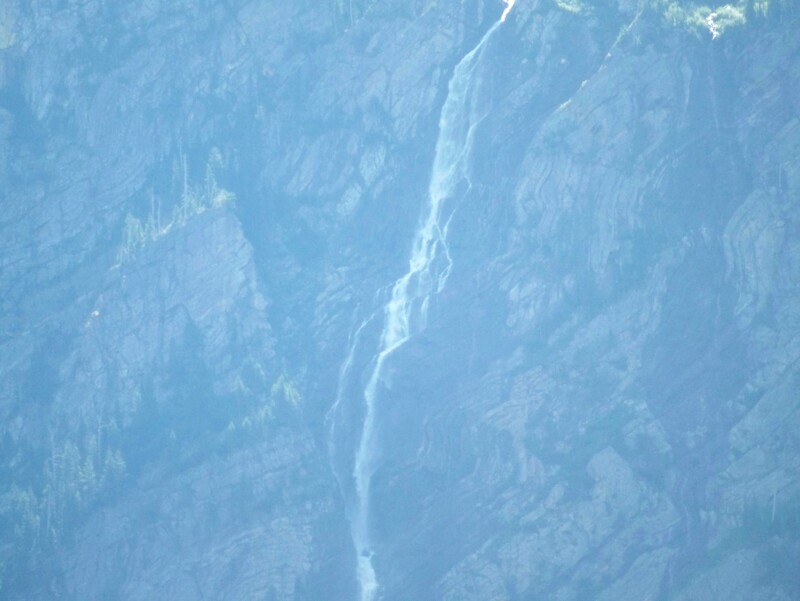 The glaciers are slowly receding and some estimates suggest they may be gone by mid-Century. Looking straight across from the road, you can see the ice and snow almost at eye level and further out is Jackson Glacier. The road is dotted with short barriers and are not very wide. The Montana sky is a constant backdrop for the mountains, the ice and snow, and the green in the foreground. A person constantly feels like they are on the top of the world here. 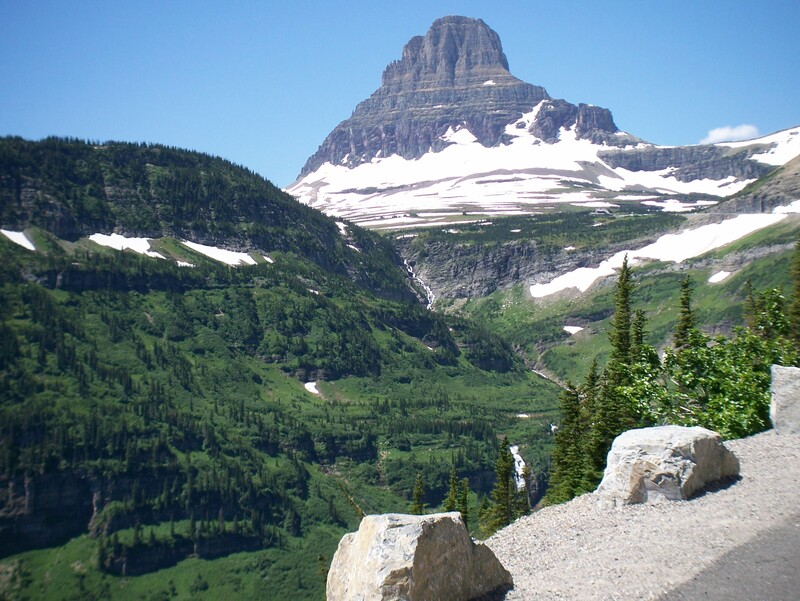 People refer to Glacier National Park as the Crown of the Continent and closeness to the tops of the mountains is a reason. 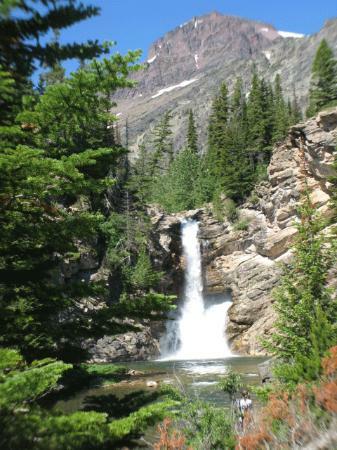 Waterfalls are often in view. Here, there are no real barriers at the edge of the road. Kathy took this picture over her shoulder. It shows the switchbacks and curves in the road. I enjoy the contrast provided by the grey granite and the white snow and ice. There is stability and, at the same time, instability visible in nature. The granite looks like it forms a stairway to the top of the world. 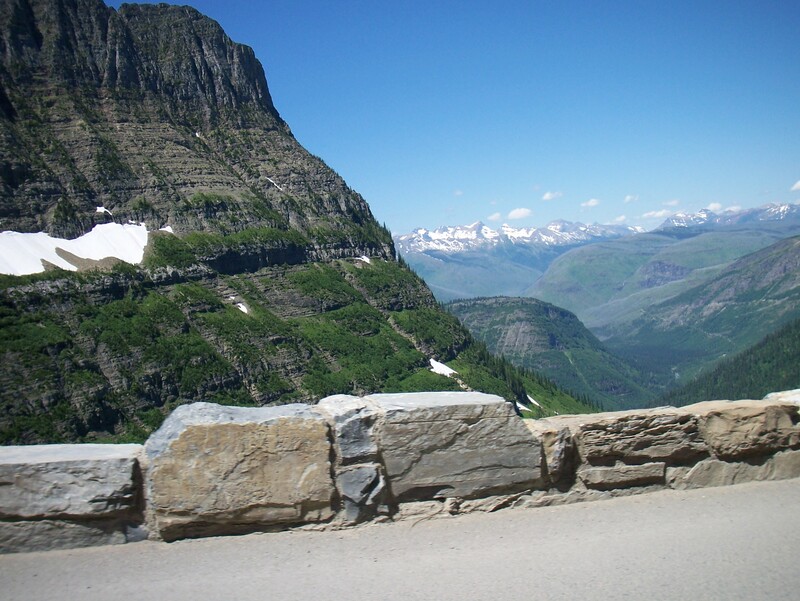 Posted in Mindful Life, Nature in All Its Glory, Photography, Reflective Moments, Uncategorized and tagged creativity, Glacier National Park, Going to the Sun Road, Jackson Glacier, Logan's Pass, Mindful Practice, montana sky, nature, photography, Rocky Mountains. Bookmark the permalink. Kathy took most of these pictures driving through Logan’s Pass. 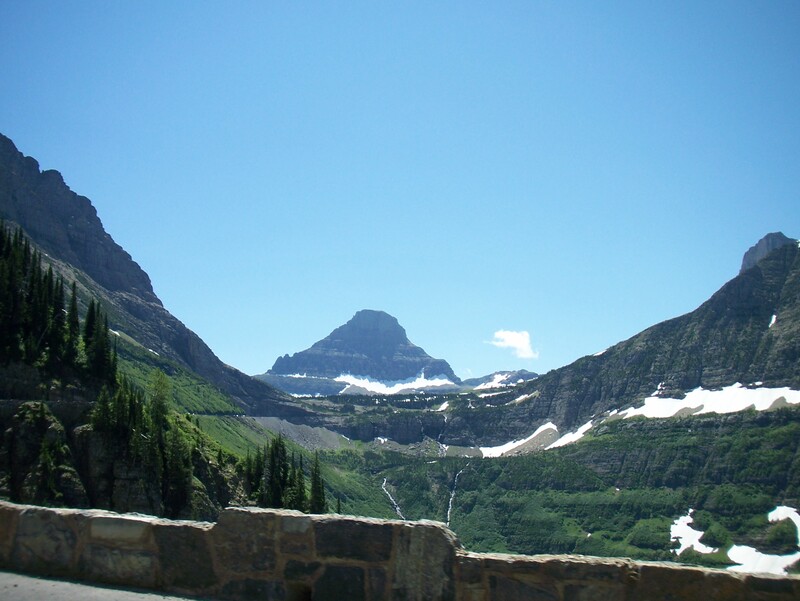 Glacier National Park is appropriately named. 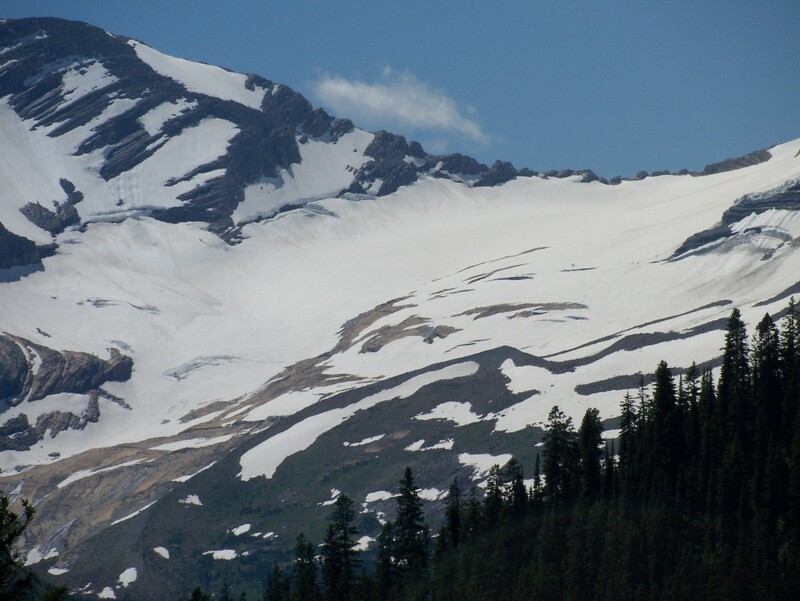 Most of the white spots in the pictures are glaciers or snow pack. 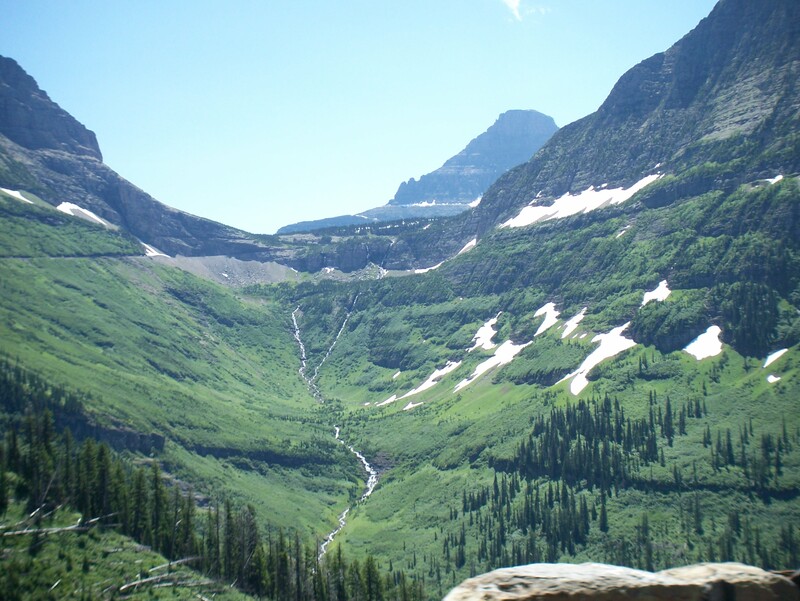 There are about 37 glaciers left in the park and most of them are receding or shrinking in size. 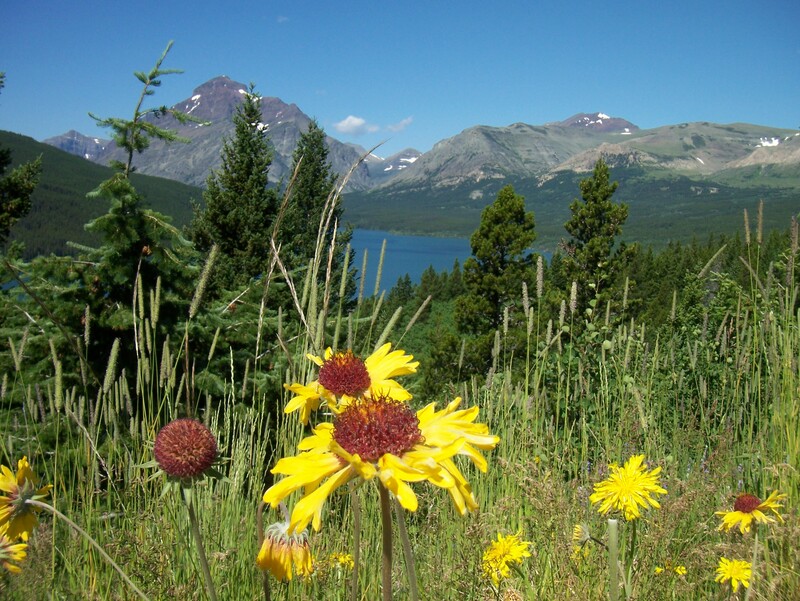 We came through the park a later in the summer, but there we saw some of the wildflowers in bloom on the way up Looking Glass Hill overlooking Two Medicine Lake. 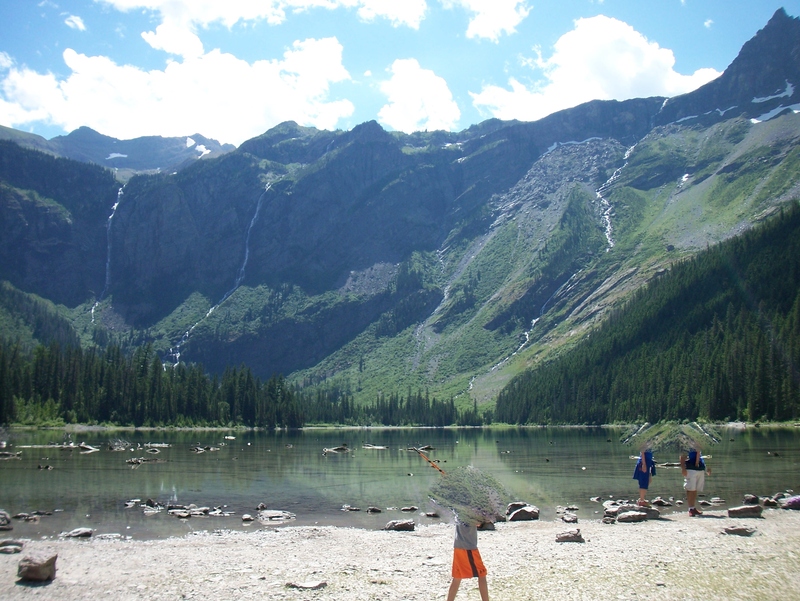 The mountains and lake serve as a spectacular backdrop. We walked around the lake later. 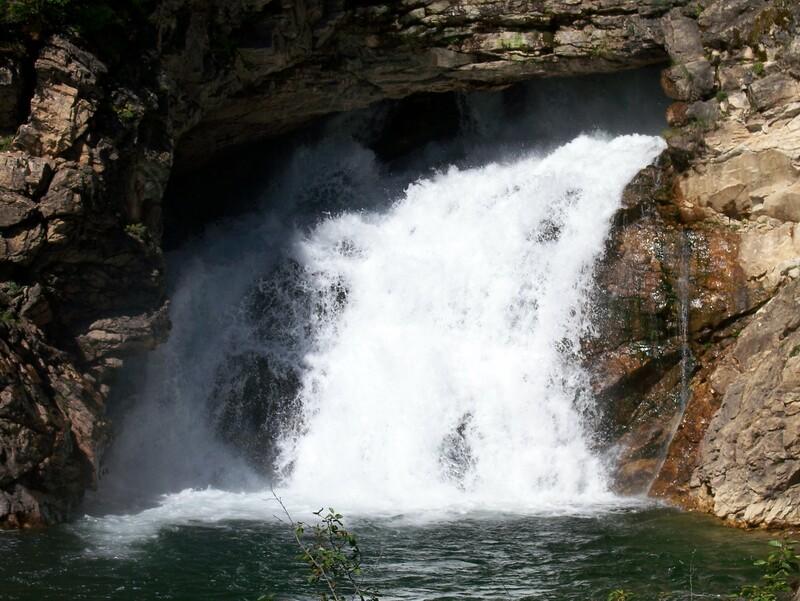 This is looking downstream from Running Eagle Falls or Trick Falls. 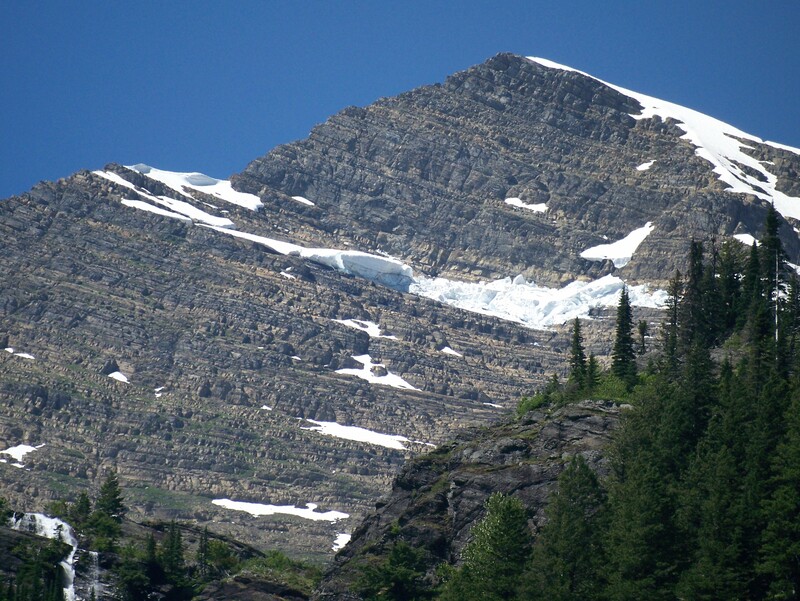 The glacier on the mountain would likely be considered one of the 25 active glaciers in the park. An active glacier is one that is 25 acres or more. Over 90% of the park is wilderness. 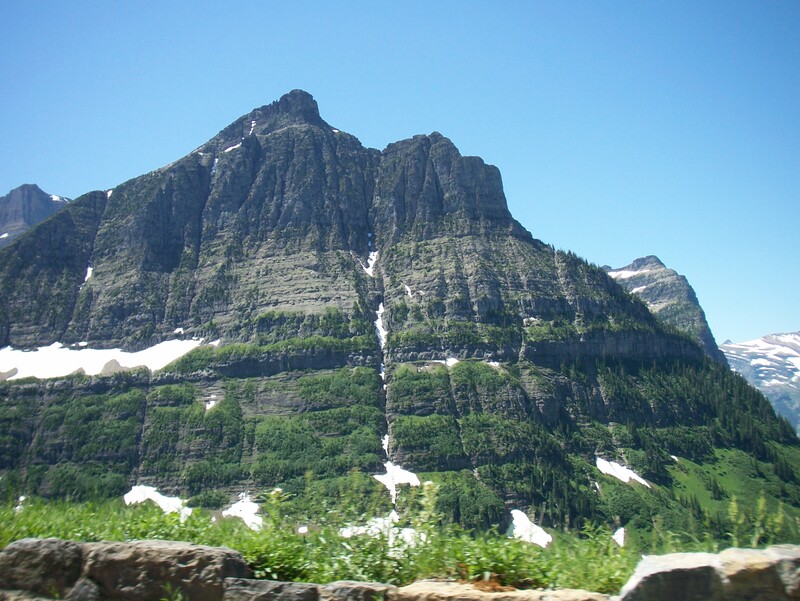 This is Jackson Glacier. Although it does not look very high, it is deceptive. 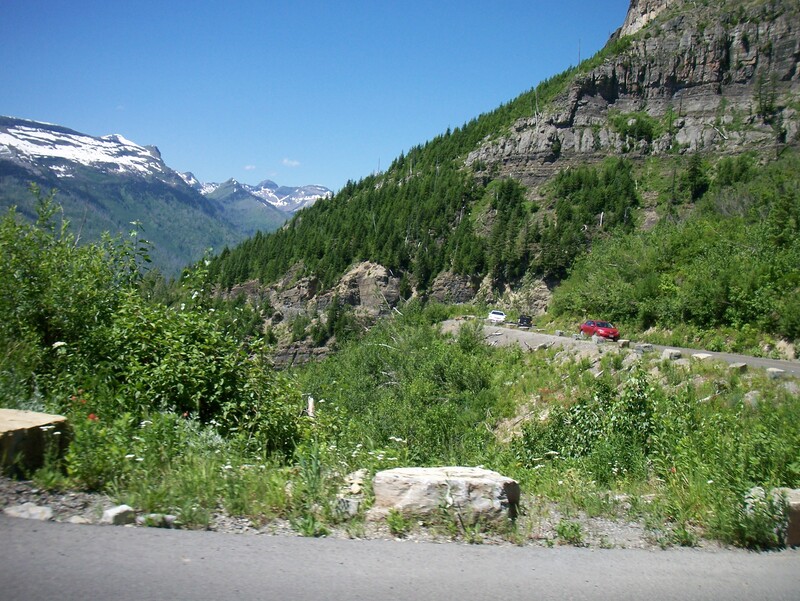 The roads climb well up into the pass and travelers end up closer to the mountain tops. This is the tourist stop in Logan’s Pass with the mountains in the background. Parking is at a premium here so we did not get to stop. Most of the pictures we took going through the pass were from the car without stopping. Again, the peaks are not much above the road level. 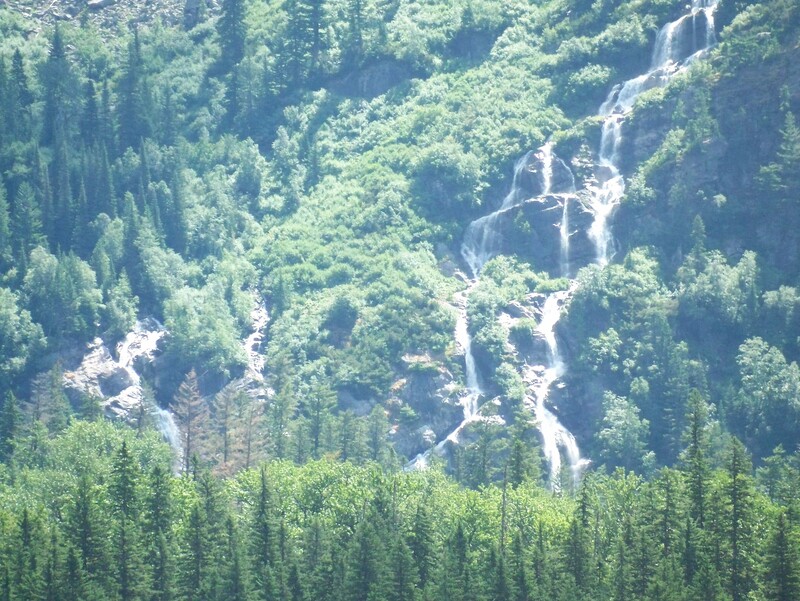 Waterfalls ribbon the mountainsides as they are constantly fed by the glaciers. If you look closely at the picture below, you can see about 3/4 of the way up the road on the left side. It is a slight darkening. The middle of the picture, below the background peak, is basically where the road reaches the summit of Logan’s Pass . 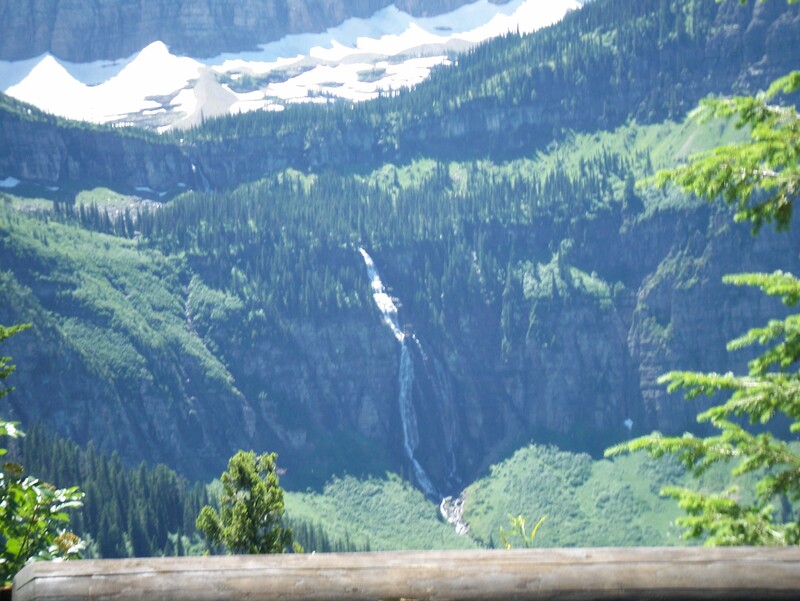 Posted in Mindful Life, Nature in All Its Glory, Photography, Reflective Moments and tagged creativity, Glacier National Park, Jackson Glacier, Logan's Pass, Mindful Practice, nature, photography, Rocky Mountains, running eagle falls, teacher as transformer, two medicine lake. Bookmark the permalink. 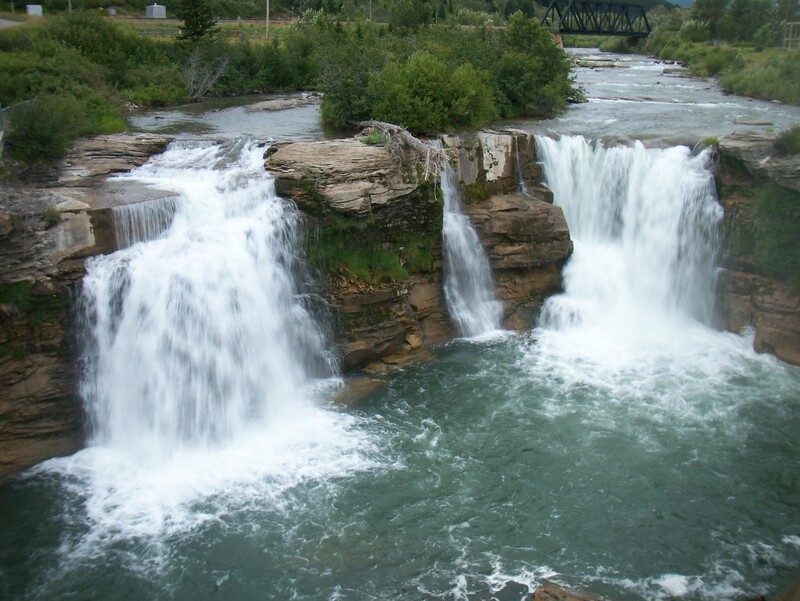 Posted in Mindful Life, Nature in All Its Glory, Photography, Poetry and tagged creativity, crowsnest pass, Mindful Practice, mindfulness, nature, photography, poetry, Rocky Mountains, teacher as transformer. Bookmark the permalink.